On the northern edge of sprawling Los Angeles is the city of Santa Monica, more an extension of LA than a distinct destination. Since its beginnings in the late 1800s, Santa Monica history has been focused on leisure and entertainment for Los Angeles. It remains an upscale district for LA, popular for its beach, pier and shopping promenade. In the 1890s when the Southern Pacific Railroad finally made its way to Los Angeles, the village of Santa Monica desperately wanted to become the site of the planned port. Alas, the decision went south to the Port of Los Angeles. However, this was a stroke of fortune, as it allowed Santa Monica to write a different kind of history - not of bustling industry, but of fun and leisure. In the early 20th century, amusement piers were all the rage with Americans. 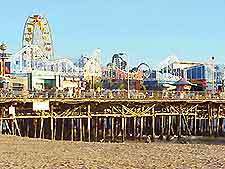 There were five piers in Santa Monica alone, although today only the iconic pier remains, with its Ferris wheel and carnival games. It was built in 1909 and is the oldest standing amusement pier in the US. Besides its piers, Santa Monica had a great stretch of beach. The Pacific Electric Railroad transported people all over the Los Angeles metropolitan area, allowing Santa Monica to grow as a popular beachside getaway from the city center. Opulent beachside resorts like the Miramar Hotel, which opened in 1925, and Club Casa del Mar (1926) catered to wealthy Los Angeles residents and tourists. These hotels, along with other historic downtown buildings like the Bay City Building, are still in use. As Hollywood grew in stature, many film stars such as Greta Garbo, Cary Grant and Will Rogers moved to Santa Monica, where they bought huge ranches and built mansions. Upon his death, Will Rogers deeded his land to the public, resulting in both the Will Rogers State Park and the adjacent Will Rogers State Historic Park, where his original ranch house is preserved. These two parks are among the most popular in this part of California. In 1958, the Civic Auditorium opened as a place where top bands and singers could perform. Other bright spots of development included Edgemar and the Santa Monica Place, two open-air pedestrian malls designed by legendary architect Frank Gehry in the 1980s. Most recently, the Santa Monica Promenade has become a hugely popular mixed-use retail, dining and entertainment complex. The promenade development spurred a wave of other projects for the city, pushing the modern history towards one of upscale retail and entertainment. With Hollywood and downtown Los Angeles so close, Santa Monica remains a popular place to visit for a day at the beach and shopping excursions.